On January 31, the Jammu and Kashmir police arrested two local peddlers in Kupwara with almost 19 kilograms of brown sugar worth Rs 80 million in the international market. “The narco-smuggling network in regions like Kupwara is so intricate that every month, we confiscate twice or thrice such consignments, and each consignment consists of a kilogram of narcotics, at least,” said Ambarkar Shriram Dinkar, SSP Kupwara. “We intercepted a Tata Sumo vehicle and recovered 19 kilograms of narcotics substance from the possession of two men, namely Zameer Raina and Riyaz Badan – residents of Amrohi, Karnah,” Ambarkar added. Although cannabis –though illegal – is locally cultivated, the consignments of heroin and cocaine enter the Valley via the Line of Control, mostly through the northern parts of Kashmir. In areas close to the LoC, the supply of narcotics is in such abundance that a gram of heroin costs just Rs 500. “Keeping in view the severity of the infestation of the problem, a separate drug de-addiction and rehabilitation centre for district Kupwara is going to be established soon” said Ambarkar. “Besides the proposal for the DDRC, we make sure that the smugglers and peddlers are punished severely – most of the times with the Public Safety Act” he added. Substance abuse has been prevalent in the Valley since the 1980s. However, lately – especially since 2015 – the rampant drug abuse by Kashmiri youth has caused acute concern throughout the Valley. The problem is so steep that the head priest at the historic Jama Masjid in Srinagar, Mirwaiz Umar Farooq, delivered one of his sermons entirely on the subject. The sermons are usually political in nature. Alarmed by the severity of the problem, Mirwaiz appealed to people to take part in “fighting this evil on a societal level” and told them not to wait for the government which, he said, is in a “deep slumber”. “I wonder why they (the police) are so sly and swift in arresting our youth when they protest and express their indignation on the streets” he said. “But when it comes to the actual policing, they are indifferent… ” he added. Waasif (name changed) has been on multiple drugs since 2010 – the year when his face was maimed during a protest against security forces in Srinagar. The fact that his uncles were killed during the past three decades due to their participation in the armed rebellion resulted in the incessant harassment of his father by the forces. “My father was picked up by police every now and then because my uncles, who’re now dead, were militants” said Waasif. The torture they unleashed on his father “made him impotent”. “Everyone would mock at me, that ‘your father is not a man now’, and the comments hurt me and it pushed me into solitude,” said Waasif. The resentment forced Waasif to protest against security forces on the streets every time he got a chance, and in the month of August in 2010, he suffered the injury which has disfigured his face permanently. “I remember, when in a protest in Nowhatta, my jaw was hit by a tear smoke shell and I fell unconscious,” he said. “Since the day my face got scarred, I feel lonelier, because even my closest friends have abandoned me; because my blemished mouth smells foul, owing to the accumulated food chunks that get stuck inside it,” he added. Since then, he could not deal with his emotions and loneliness. He felt that smoking marijuana would give him an escape. “It was only cannabis earlier. It did not work much. Now, I have been doing almost all sorts of drugs – brown sugar, heroin, spasmo-proxyvon capsules, inhalants… All of them, but they still don’t help me get rid of my past… ” he said. There are numerous reasons specialists ascribe to youth resorting to drugs: influence of a friend circle or ‘peer influence’ , curiosity or ‘novelty-seeking behaviour’ or a traumatic experience which needs escaping from. These reasons are compounded by the easy supply of money available to children, owing to over-pampering by their parents. Dr Muzzaffer Khan, a clinical psychologist who is currently heading the police drug de-addiction centre, believes that, usually, it is under the influence of one’s company that a person resorts to substance abuse. “Recently, 14 people have been admitted into this facility and 13 of them have done this because they have seen their friends doing so… ” he said. “Only one of the patients was orphaned at an early age, which led him into depression” he added. Cases related to drug abuse have risen sharply in the last few years. However, earlier studies by renowned psychologists like Mushtaq Margoob, in the Indian Journal of Psychiatry in 1993, have shown that drug abuse has been prevalent since the 1980s. “… Total of 9,726 cases of substance-related disorders were reported to Institute of Mental Health and Neurosciences (IMHANS) in a period of eight years starting from January 1980… ,” the study stated. Since 2015, though, we have been consistently seeing over 6,000 cases of substance-related disorders per year at IMHANS. A 2013 study by Dr Yasir Hassan Rather and others from IMHANS, using data from a drug de-addiction centre in Srinagar and published in the Malaysian Journal of Medical Sciences, says that “over two-thirds of patients in the study had started substance abuse in the age group of 11-20 years”. The study also identifies commonly abused substances – nicotine, medicinal opioids, cannabis, benzodiazepines, other prescription medications, alcohol, inhalants and cocaine. In police drug de-addiction centres alone, there have been 5,265 cases of drug abuse reported to the OPD since January 2017 – of which about 785 cases needed urgent medical attention and had to be admitted. Comparing these numbers with those of the period between January 2015 to December 2016 – when 3,236 cases were reported, out of which 208 were admitted – there has been an overall rise in the rate by 62.7%, which is alarming. He believes that the turmoil which the Valley has seen in since last three decades plays a grim role. Firstly, schools and colleges are shut every now and then because of ‘strikes’, owing to which youth are not able to complete their degrees on time and this makes them feel insecure about their future. This insecurity leads them to depression and they resort to drugs. Secondly, because of the gravity of the situation in the Valley, issues like mental health and drug abuse are not much given attention by society. 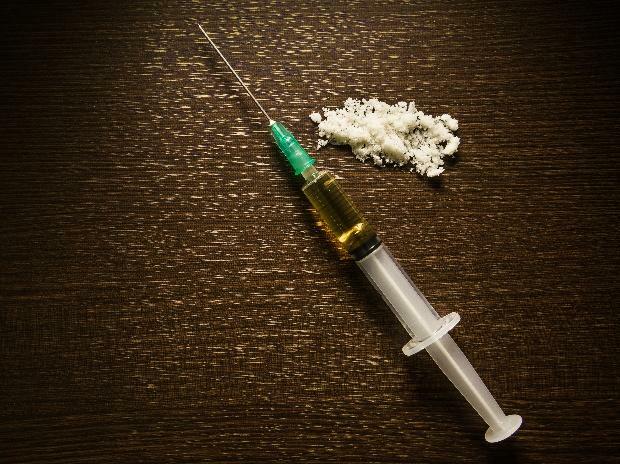 Last year, IMHANS – in collaboration with the department of psychiatry, SKIMS Medical College and the Jammu and Kashmir Aids Control Society – proposed to the government a drafted policy to curb the menace of drug addiction. The policy, which was finally approved in January, consists of directives which would be executed by the government at an organisational level, while the responsibilities would be shouldered by non-government stakeholders. Dr Arshad Hussain, a renowned psychiatrist in the Valley, said that the policy is of vital importance and the directives “… Would be executed in part by the organs of the state. For instance the excise department, police… ”, and the rest would be incorporated on a non-government level. The drafted policy also includes a chapter called ‘rules and regulations for a de-addiction centre’, which contains the necessary guidelines for rehabilitation centres in the Valley.